Samir lives on and the struggle goes on! 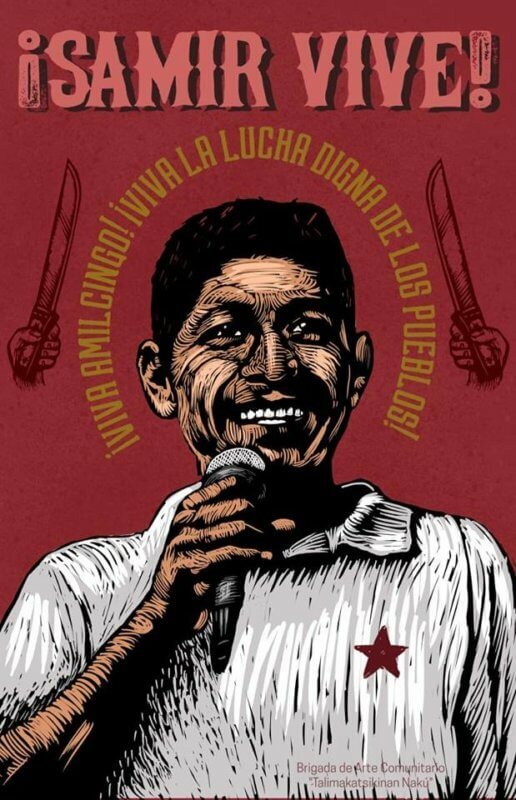 With sorrow and rage, thousands of Mexican people are mourning the assassination of Samir Flores Soberanes and promising to carry on on his commitment to the defense of the land, water, education, grassroots communication and autonomy of the people. On February 20th at 5 o’clock in the morning, Samir Flores was killed just outside his front door in Amilcingo, state of Morelos. “Around 5 o’clock in the morning, two carloads parked outside his house and began to call him until Samir went out; four shots were heard and two of them hit him in his head, killing our comrade,” says a statement released by the Peoples’ Front in Defense of the Land and Water in Morelos, Puebla and Tlaxcala. People immediately began to arrive in his town for the wake that was held with much love and affection. Samir was then sown in the earth, from which many more forms of struggle will surely spring. 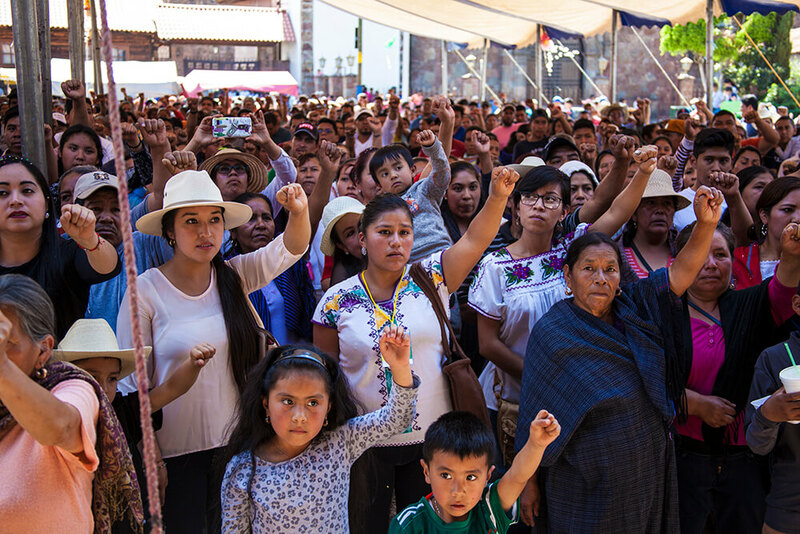 Since then, there have been protests and acts of solidarity in Amilcingo, Huezca, Puebla and Mexico City, and messages of support have arrived from different parts of Mexico and the world. “Cheerful, brave, untiring, solidary and committed, with clear ideas, Samir was an example of struggle for all of us,” say his comrades in the Front. They highlight the fact that this Nahuatl indigeonous man was the founder of the Amiltzinko Community Radio100.7 FM, and that he worked with the children in the community “teaching them to know and love their territory.” He also belonged to the Parents’ Committee of the school in Amilcingo. For almost a decade, Samir Flores Soberanes fostered resistance to an energy project proposed by the Felipe Calderón regime, with no free, prior, informed consent as required in the International Labor Organization Convention No. 169 on Indigenous and Tribal People, and other international accords. The project consists of two thermoelectic power plants in the nearby town of Huexca, to be fueled with gas from the state of Puebla, by means of a gas pipeline that would run along the outskirts of the Popocatépetl volcano, affecting the mainly indigenous communities in the states of Tlaxcala, Puebla and Morelos, including the town of Amilcingo. The Statement of Environmental Impact revealed the dangers involved in having a gas pipeline in the area of the volcano. A gas pipeline that goes right up to the volcano? Isn’t that crazy? asked a 10-year-old. Andrés Manuel Lopez Obrador said the same thing in 2014, when he visited Huexca during his campaign for the presidency of Mexico and vowed to cancel the project. Now that he is President, everything’s changed, and the interests of the huge multinational corporations rule. Last February 10th, in a rally held in the city of Cuautla, the President announced a consultation that is illegal, illegitimate and unequal, and accused opponents of the Huexca project of being “leftist radicals” who are also “conservatives” for not favoring the “change” that he is proposing. During the rally, Samir and his comrades denounced the damage that the project would do in their communities. On February 11th, the Front sent a letter to Lopez Obrador, warning him that his “consultation” could lead to violence in the affected communities. On February 19th, the delegate of the federal government in Morelos, Hugo Erick Flores, participated in an “informative assembly” in Jonacatepec, near Amilcingo. There, Samir Flores received applause for his arguments against the megadeath project, including a reduced supply and lower quality of water in the affected communities, as well as the production of acid rain caused by the gas from the power plant. 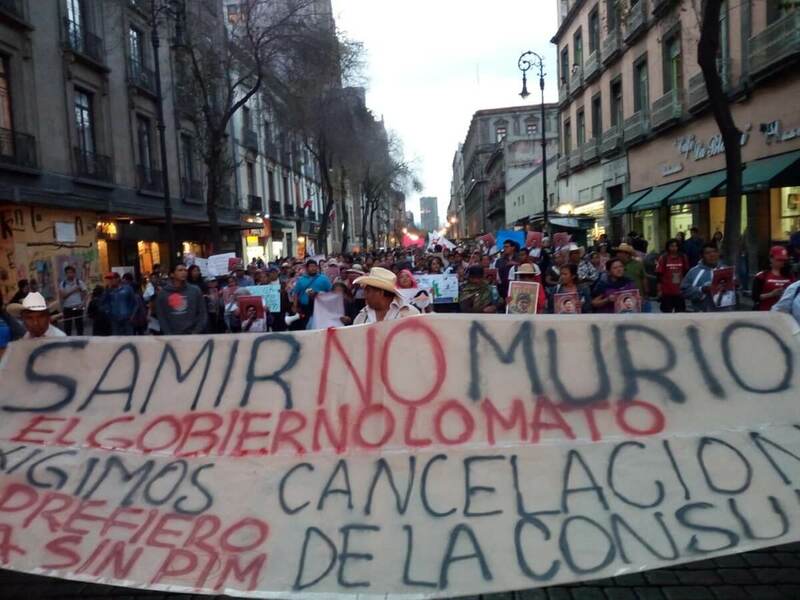 On both occasions, Samir denounced the “consultation” planned by López Obrador throughout the state of Morelos, ignoring the long struggle in the communities directly affected by the project. The president said that he’s sorry about Samir’s death but that the consultation will go on as planned. 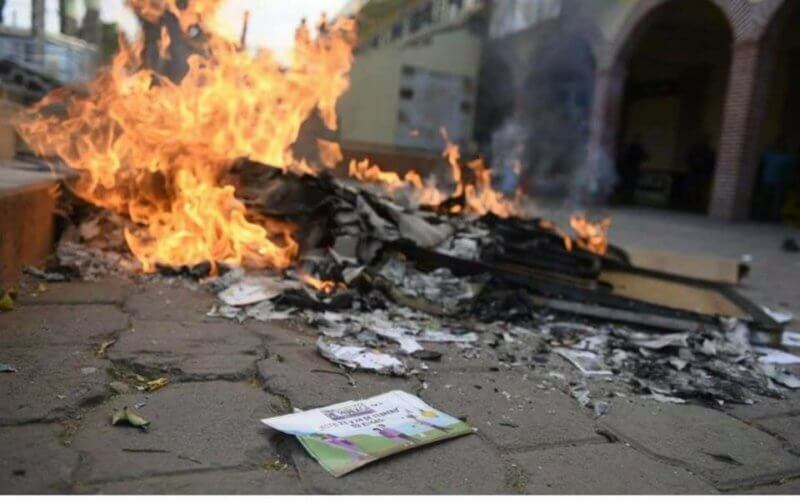 Today, February 23rd, the first day of the consultation, there have been ballots burned at polling points and arrests of comrades who were handing out information about the risks of the power plant. Posted on February 23, 2019 February 24, 2019 Categories: Education, Indigenous, Land Defense, RepressionLocation: MorelosLeave a comment on Samir Didn’t Die! He Multiplied! 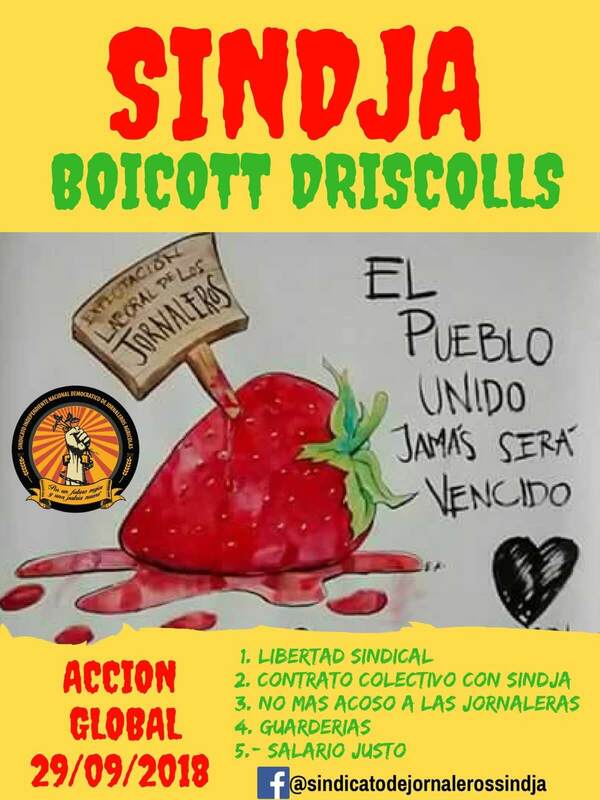 Driscoll’s, and the companies which supply them berries, such as BerryMex, Moramex, Santo Domingo, Martín Reyes, Munguia, etc, besides paying miserable wages, they deny unions free access to their employees. In contrary, all their workers that organize or affiliate with another independent union are fired. And also workers are only hired under the condition that they are not affiliated with the Regional Confederation of Mexican Workers (CROM). For this and many more abuses, we invite everyone to shout with one united voice, on September 29. On Sunday May 27, 2018, the indigenous Purépecha municipality of Cherán, Michoacán, named its Third Council of Elders (Consejo Mayor, Consejo de Keris) to their communal government. Today Tuesday 17th of July at 11:30 AM, a group of armed men with ski masks dressed in military style uniforms broke into Abraham Hernández Gonzales’ home in Salchi, Pochutla, and they violently took the compañero from his home. They later transported him in a gray pick-up truck with license plate number RH-70-92 along with motorcycles which escorted the truck. Immediately after Hernandez Gonzales was picked up several police agencies were notified and none of them made any effort to find the compañero, who after five hour was found dead near the same community. Oaxaca Governor Alejandro Murat is directly responsible for this kidnapping and assassination of our compañero Abraham Hernández, who carried out the important job of local coordinator for the community of Los Ciruelos. The government’s lack of interest in solving cases like this one demonstrates its complicity with criminal organizations that operate in the region and the state. Allowing these organizations to operate freely at all hours of the day without being detained by anyone illustrates the farce that is the government operation “Safe Beach”; in reality these are the places with the greatest degree of insecurity, and even more so with the return of the PRI to Oaxaca’s state government, whom we know are connected to narcotics trafficking.